Mini MRP. Low cost inventory and Multi Level BOM Software. MRP and Multi Level BOM Software. 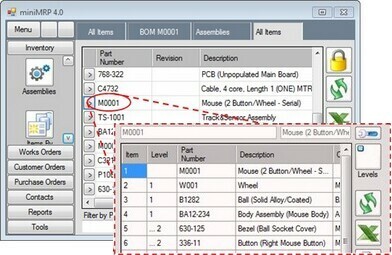 Inventory, Parts-Lists, Vendors, MRP and Multi Level BOM Bill of Materials. 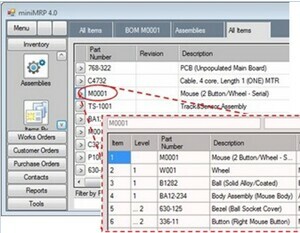 MiniMRP for Windows 10, 8, 7, Vista and XP(SP3) is a low cost, easy to use Inventory and Parts List Manager with Multi Level BOM (Bill of Materials) and other MRP-Like features usually only found in larger ERP/MRP packages. If you are looking for an Inventory Manager with Multi Level BOM capability without the associated running costs of an overweight ERP/MRP system then you really should take a closer look at MiniMRP. MiniMRP includes purchasing, customer orders, work orders, multi level bills of material, shortage forecasting and many other MRP features in an easy-to-use Inventory Manager costing less than $200. Perpetual licence - buy once use forever. No repeat fees, subscriptions or support charges. Download a free 30 day trial. If you need longer we can extend your trial period up to 60 days if necessary. The trial version is fully functional - Enter as much real data as you want - any data you create during your trial is not lost once you purchase the fully licensed software. MiniMRP is small and it's simple to use because it doesn't waste space on the features that nobody uses anyway. Why maintain an over-complex ERP/MRP system when all you really want is something that will manage your inventory and, if required, build and cost single and multilevel Bills of Material. Optionally connect to Microsoft SQL Server or MySQL/MariaDB for better concurrency in larger work groups and improved remote access performance. Copyright (c) 2019 Axis Controls Ltd.